*Warning* This is the final book in a trilogy, so if you have not read the first two books and don't want to be spoiled on anything, don't read any further! I had the strong urge just to smack my hands down on the keyboard a couple of times and hope that whatever came out would accurately express to everyone how excited I am about this book. Of course, I like my computer, so I decided not to abuse it. GUYS! THIS BOOK! I've been a little bit fangirl crazy over the Hex Hall series, I mean it's got lot's of magic, mean girls, cute boys and so much funny! The final book in the trilogy was an excellent ending to the series and I think it's the fastest I've read a book in ages. SPELL BOUND starts off right where DEMONGLASS left off. We find Sophie as she's spit out of the Itineris and trying to determine where she's ended up. After a run in with a werewolf and a little help from the unlikliest of sources, she ends up in the Brannick compound. That's where the crazy really starts. Sophie learns some shocking truths about the world she's become a part of since she first started at Hex Hall and without her powers she isn't really sure where she fits in at this point. There are some serious things brewing with the Casnoff sister's and Sophie knows that they need to be stopped, but getting to them is a lot easier said then done, because Graymalkin Island and everything on it has disappeared. Let's talk a little about the boys, shall we? As I might have mentioned before, I was not a fan of Archer at all in book one. I know he was supposed to be the dreamy guy and the perfect fit for Sophie, but I just didn't buy him. 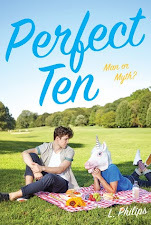 I was firmly on Team Cal by the end of the first book and while Archer grew on me a little in book two, I was still a Cal gal (see what I did there...hehe). In book three we see a lot from both guys and by the end of the book I was rooting for either one, but mostly I was rooting for Sophie and her happiness. Granted, getting to that happiness wasn't exactly an easy feat and even though we get a very satisfying conclusion, things aren't all butterflies and puppies, and we know it's going to be an interesting road ahead for Sophie and crew. Good to know the momentum wasn't lost. I love this series and like what you said, it's fast paced. About the boys, that's why I don't pick teams, there's always a curve ball somewhere. I'm so glad to hear it's awesome! 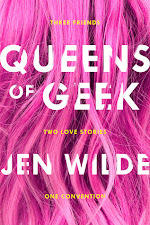 I devoured the first two - I can't wait to get my hands on this one! I'm glad the releaste date finally came. I can't wait to read this book, but I'll have to reread the first two books, I've read so many books I forgot what this one was about. I am dying to read this! I'm glad you enjoyed it, hopefully I will too. Great review! That's one of series that I'd like to read, but haven't started yet. This series is so cute! 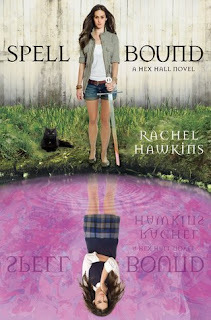 I can't wait to read Spell Bound.